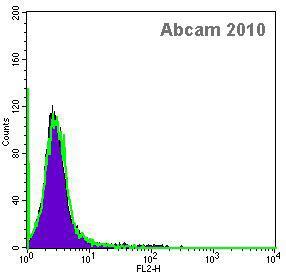 Rabbit polyclonal Aryl hydrocarbon Receptor antibody. Validated in WB and tested in Mouse, Human. Independently reviewed in 2 review(s). Immunogen corresponding to synthetic peptide. Our Abpromise guarantee covers the use of ab28698 in the following tested applications. WB Use a concentration of 2.5 µg/ml. Detects a band of approximately 85 kDa. Good results were obtained when blocked with 5% non-fat dry milk in 0.05% PBS-T.
Cytoplasm. Nucleus. Initially cytoplasmic; upon binding with ligand and interaction with a HSP90, it translocates to the nucleus. ab28698 has not yet been referenced specifically in any publications. Publishing research using ab28698? Please let us know so that we can cite the reference in this datasheet. Thank you for contacting us. Your credit note ID is xxxxx. I am sorry that this antibody did not perform as stated on the datasheet. I have asked our accounting department to issue a credit note for you, which can be redeemed against the invoice of a future order by passing it on to your purchasing department. To avoid confusion, please ensure your accounts department is aware of how the credit note is being used. If you have questions on how to use the credit note, please contact our accounting department. If payment has already been made on the original order and you wish to receive a refund, please ask your purchasing department to contact our accounting department so that we may gather the correct information needed for the refund. To avoid confusion, please ensure your accounts department is aware of how the credit note is being used. Our accounting department can be contacted by email at us.credits@abcam.com or by telephone using the information at the Contact Us link in the top right corner of our website. Please refer to the credit note ID in any correspondence with our accounting department. The credit note ID is for your reference only and does not automatically guarantee the credit. I hope this experience will not prevent you from purchasing other products from us in the future. Our Scientific Support team is always at your service, should you require further expert advice.